Pop the Cork: A little bubbly makes it all better. "I will drink champagne anywhere, anytime, with anyone," a wine instructor I had back in my cooking-school days staunchly proclaimed to every single group of students that came through his classroom. Those who have fallen under the glistening persuasion of champagne can understand that almost anything is better with champagne, so why resist? Swanky people like Noël Coward and Cole Porter drank champagne, and so can everyone else. So can you, anytime, anywhere, with that one person, the person who goes to your head and lingers like a haunting refrain as the bubbles in a glass of . . .
That's right, this is a Valentine's Day thing here. It's the season of heart-shaped boxes of chocolates and red roses and package dinner deals for couples. All of those trappings, the sentiments of sentiment, are so exclusionary to people who don't have that someone to be all mushy with. It's unfair! Drinks, though, they are for everyone, from the pie-eyed lovelorn to the beef-hearted cynics. Skip the bonbons and the châteaubriand in green peppercorn sauce and the fur-trimmed chemise from Victoria's Secret, and get right down to the nitty-gritty with your lover or spouse or mutual friends. Have some champagne. Ah, but not just any champagne--a champagne cocktail, a lovely thing whose time has come to return to fashion. Forget the palate-clubbing martinis, the frilly-sweet and too trendy lemon drops, the silly specialty tequila drinks marketed by some ex-Van Halen member. These things bludgeon the senses and dull the wit. Champagne cocktails are more genteel, and yet they are not any less alluring--mimosa, Bellini, Kir royale, pink slip (you can't go wrong with a name like pink slip!). And they sparkle! Now, now, you say, why dilute the goodness of champagne by adding syrupy liqueurs or smoothielike fruit purées? Isn't that disgraceful, or something? Well, yes, if we are talking about a beautiful Iron Horse Brut Rose or a Schramsberg Reserve. But we are not. We're not talking about Cook's either, though. The base of a good champagne cocktail needs to be good sparkling wine, but it does not need to be expensive. California sparkling wines (Mumm Cuvée Napa and Domaine Chandon will both do splendidly) and Spanish cavas like the trusty Freixenet make excellent and reasonably priced cocktails. If you really, really want to use a real French champagne, try Kritter, which is also easy to find and affordable. Unless called for, use Brut, or dry, sparkling wine instead of sweet. Oftentimes, the liqueurs and fruit juices or purées added to champagne cocktails are sweet to begin with, so with a sweet sparkling wine, the result tastes more like an alcoholic Shirley Temple. 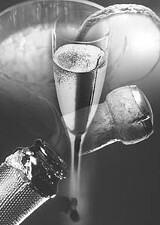 Always build champagne cocktails in tall, slender champagne flutes, not the saucerlike coupes, which, though modeled after Marie Antoinette's breasts, tend to encourage the bubbles in the sparkling wine to escape. Add the sparkling wine last and for God's sake, don't stir unless you absolutely have to. Some champagne cocktails call for crushed ice, which, as a semipurist, I am categorically opposed to, but I guess if you're going to go around mucking up good bubbly with other stuff, it can't make too much of a difference. The point, though, is that sparkling wine is not too precious to have fun with. The classic champagne cocktail (called, fittingly enough, the "classic champagne cocktail") exists in two versions. Its origin is unknown, but it's been around in America at least since the late 1800s. Place one small sugar cube in a champagne flute, soak the cube with two dashes of Angostura bitters, and fill the glass with sparking wine. Version two adds an ounce of cognac. Sophisticated and subdued, both versions are worth checking out. Probably the best-known champagne cocktail is the mimosa, a fixture of celebratory brunches, which after a long night of revelry is a fine way to ingest both vitamin C and the hair of the dog that bit you. Many people think a mimosa is just a vague mixture of orange juice and sparkling wine, but a true mimosa requires an all-important two dashes of Grand Marnier. Fill a champagne flute one-third full of freshly squeezed orange juice, add the Grand Marnier, and finish with sparkling wine. The sunny yellow shade of the result is similar to the yellow blossoms of the tropical flower the mimosa derives its name from. Sadly, now is not the time of year for Bellinis, unless you have a cache of frozen, white peach purée from this summer or you really like overpriced, out-of-season, pithy peaches. But that's fine, because there are plenty of other things to drink. Like Kir royales. A deep, blushing pink-red shade, the Kir royale looks like a Valentine's Day drink. These things will someday be my undoing. I could sip them all night long, because they are ripe and fruity without being too sticky-sweet. Originally made with still white wine and called simply a Kir (farm workers in Burgundy added cassis to wine to make it more drinkable), the drink's name earned its regal promotion when the still wine was switched to sparkling. Add one-half ounce crème de cassis to a champagne flute, and fill up the balance with the good stuff. There are other marvelous sparkling-wine-based drinks in all kinds of incarnations with all kinds of different names, so it's fairly easy to say that the sky is the limit. A Kir royale marks what is the simple pattern for many champagne cocktails: liqueur X + sparkling wine = cocktail Y. Chambord, crème de menthe, Cointreau, B&B--anything sweet and fruity works well, as do aromatized aperitif wines like Lillet and Fernet-Branca. For the five of you out there who actually like the musty, medicinally bitter Campari, Campari and sparkling wine make a unique cocktail. Ah, yes. With love in the air and frivolity in our drinks, the pressures of the world melt away, if only for a moment. Who needs the Bush administration? Who needs the axis of evil? Who needs a significant other? Who needs anything when there is the night and there is champagne--and if not champagne, at least sparkling wine--and there are stars to glimpse and old standards to listen to on the stereo. Anytime, anyplace, anywhere. But do yourself a favor and choose your guests wisely, because good drinks taste better in good company.